"The fundamental nature of the Mitchell and Kenyon collection really changes our perspective of early filmmaking history in Britain." Early cinema history remains a mystery to most casual filmgoers, and while the release of Electric Edwardians: The Lost Films of Mitchel and Kenyon won't mean much to the average home video viewer, those with an interest in in the subject, or English daily life and culture during the Edwardian era (the films here span 1900-1913), will find the material of great interest. Sagar Mitchell and James Kenyon worked as traveling hucksters of a sort, filming whatever local events or people they could that would make them some money. The films they made were then screened at the local fairground or theater or other venue. The pair passed most of their time in the northern half of England, spending the period of roughly 1900 to 1913 shooting these "local color" films. That would have been the end of that, until several cans were discovered in a Blackburn shop basement. The cans revealed more than 850 reels of negative, all of it the output of Mitchell and Kenyon, and obviously thought long gone, as prints of their work had not survived either. The British Film Institute painstakingly restored and preserved the fragile material, and we now have the fruits of those labors on this disc. In Britain, a three-hour documentary preceeded this collection, and if there is one weakness of this disc, it is assumption of prior knowledge of the discovery of these films and their background. The films themselves are split into general subject areas: Youth and Education, The Anglo-Boer War, Workers, High Days and Holidays, and People and Places. The films are loosely related in subject matter, and generally last only a short time, usually under five minutes. As Mitchell and Kenyon were trying to sell their wares to as big an audience as possible, crowds often predominate, be they at parades, sporting events, ceremonies, or otherwise. I was struck by the social aspect of the films; these are portraits of people together, something that seems lost to me in this day and age, where it's often one person to a car, all individuals on their way. Here, the feeling is one of community. That's quite possibly me reading too much into it, but it's the lasting impression I have. There is also the knowledge that these people are all long dead, and staring back at us still, having gained some anonymous form of immortality. What's of interest as well is the focus on the working classes—very few of these films concern the elites. And, one last observation: with cinema a new, gimmicky invention, the people filmed don't seem to know quite how to act with the camera aimed at them. They often stare directly at it, as if puzzling out exactly what is happening. No one really behaves differently for the camera, because its place in socety wasn't yet assured. It's fascinating to watch. There is plenty more to discover here, and despite the lack of background information about the films and their survival, this disc is a release we should be thankful for. Image Transfer Review: Presented in fullscreen as shot, these films look amazing considering their age and the circumstances under which they were stored. There are the inevitable problems even restoration cannot fix, but overall, these look wonderful, with rich detail. The only downside is that the transfer appears to a PAL to NTSC conversion, as pausing to examine a given frame occasionally reveals ghosting. Audio Transfer Review: The films themselves obviously do not include audio, but the viewer has the option of watching them with scoring by In the Nursery or with the aforementioned score and commentary by Dr. Vanessa Toulmin of the National Fairground Archive. The score sounds fine in Dolby 2.0. Extras Review: Up first is the commentary by Dr. Toulmin mentioned above; if you're unacquainted with the milieu these films were made in, or some of the backgrounds of the participants, the commentary will do a decent job filling you in. Toulmin is also the interviewee for a featurette (14m:30s) covering more of the general background and qualities of the films. The commentary focuses more on the specific films while the interview is more general, so check out both. The fascinating Road to Restoration (20m:43s) looks at the difficult job of saving these films through a variety of restoration methods. Next up is Pictures of Crowd Splendor (09m:59s), a narrated version of an article by Tom Gunning about the filmmakers. The article is read by actor Paul McGann, and is set to numerous clips of workers leaving their factories after a day's work. Certainly worth looking at and quite an interesting piece, though some might prefer a printed version to read at their leisure. Finally, five more Mitchell and Kenyon films are available for viewing: Diving Lucy, Race for the Muratti Cup, Comic Pictures in High Street, West Bromwich, Royal Proclamation of Death of Queen Victoria, Blackburn, and Bradford Coronation Procession. Lastly, the press kit for the main program is on the disc and viewable as a PDF file. 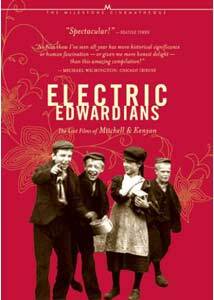 One of those amazing finds of materials long thought lost, Electric Edwardians presents an array of "local films" that cover the gamut, from school assemblies to military ceremonies to football matches to factory shift endings. If that sounds boring, it is usually anything but in the actual viewing; seeing these films is like opening a window on a lost world. This disc is basically a port of a UK release from last fall, and includes the same worthwhile extras and the same transfers.